We have lived in the tropics for the past six years, so I’m used to the thought that I am truly “not in Kansas anymore,” or more precisely, not in Canada. Things move at a different pace in the islands, there are different customs, vibes, and landscapes. These differences are never more noticeable than at Christmas. I love living the island life with my family for many reasons, just as I loved living in Canada before that. 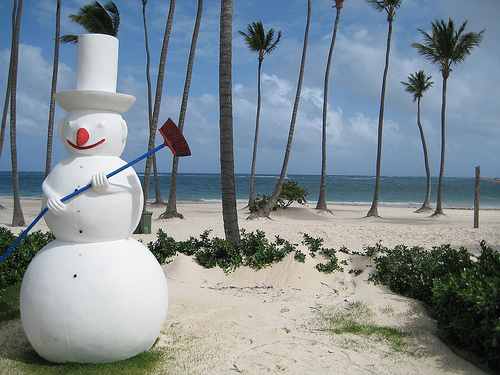 Although we welcome change, cherish new experiences, and enjoy Christmas in the tropics, this season, I’m really dreaming of a white Christmas and of home – Canada. 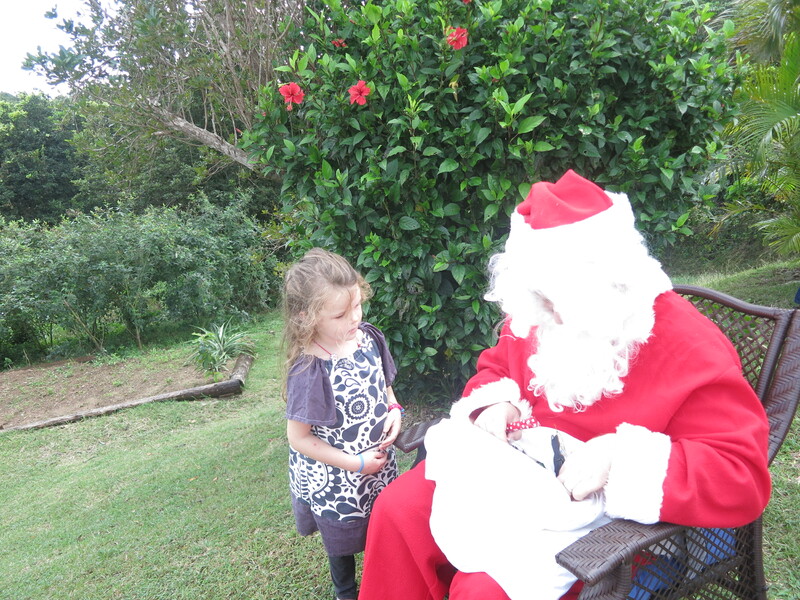 My family and I have enjoyed many Christmases on the island. One year it was so quiet, just my husband, our daughter, and me (our little guy was not yet born) enjoying a simple picnic on the back deck, and we appreciated the peace of that time together. Last year we headed to Josiah’s Bay for a barbecue and ocean fun with friends. Both of these experiences were great, but this year, I’m craving the Christmases of my past. So, this year we’re ditching paradise and coming home for the holidays, and trading in the fab for the much loved. Everyone cross your fingers and do a snow dance because we’re really hoping for a white Christmas! The beach is lovely, but at this time of year I want crisp and cold and anything pine or spruce scented. Our family loves winter sports, such as skiing (downhill or cross country), tobogganing and the like. My daughter loves making snow angels and snowmen, and I know our little guy is also going to be delighted and fascinated with his first chance to really play in the winter wonderland. In all honesty my husband and I were late on the draw the year we cooked a cornish hen, but when we finally went to the grocery store, that was the most festive bird we could find. My husband cooked it beautifully, but I love turkey and can’t wait for my mom’s or my mother-in-law’s excellent feasts. We travel home in ridiculously thin layers only to find my parents parked eight miles from the airport entrance. At least it feels that far to us, but maybe we’ve gotten soft about what cold actually feels like. Perhaps the whole family needs to put Canada Goose jackets on our Christmas list because the ancient snowboarding coats don’t cut it anymore. What a change it is to finally find stylish clothes that will also keep us warm; it’s a long way from my pre-teen years of wearing an open jacket and running shoes to school. It’s also a treat to buy something that’s 100% Canadian, a treat not often available to us. Most of our island family leaves for their (off island) homes during the holidays. Going home means reliving traditions, the family home I grew up in, my husband’s home, our dog, good friends, and many trips down memory lane. My daughter is beside herself with excitement. Since we moved to the islands we’ve only made it home once and since that first time we have either missed it entirely or only managed to squeak in after Christmas. It’s time for the whole family to have a Christmas together. I love the steel drum vibe for carols. Their sound makes you feel as though you’re on vacation even when you live here, but brass is where it’s at and the brass band renditions from my upbringing gets our family in the festive spirit. I love shopping, but after being away, the malls and plazas induce culture shock, so you won’t see me at Boxing Day sales. What my husband and I both love though, is the special events shopping, like late night Christmas shopping on Main Street in our hometown and all its beautiful and festive window displays. With all of this reminiscing, I’m now off to book my tickets. Happy Holidays and Merry Christmas to you and yours, wherever you are celebrating!